The final round took place at the eleven-turn Laguna Seca road course. 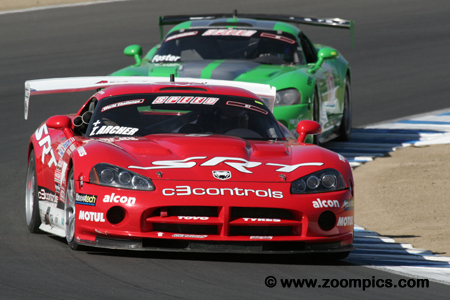 The GT class was well represented with thirty-four entries – the best subscribed event of the 2006 season. The No. 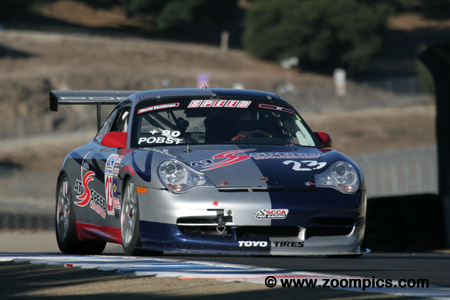 23 Porsche 911 Cup, driven by Randy Pobst qualified second. At the start, Pobst followed pole-sitter Leighton Reese for the first sixteen-laps until the two went off track. The incident dropped Pobst to third but he was able to pass Reese and chase race leader Ricardo Imery. On the last lap, in the last corner he got a better exit speed than Imery and Pobst edged him for the win by 0.031-seconds. Taking advantage of race leader’s mistake allowed, third place, Ricardo Imery to move out front for laps-sixteen to twenty-six. 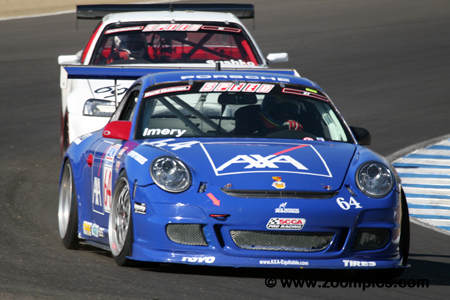 The Porsche 911 Cup driver had a win mid-season at Infineon Raceway and looked set for his second. However, he got a little sideways in the last corner on the final lap and lost his momentum which allowed Randy Pobst to pass and score the victory. Max Anglelli has an off track between corners five and six during practice. 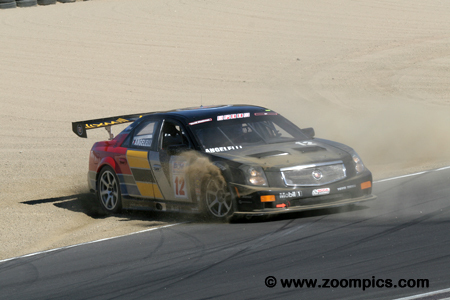 Anglelli was entered in a third Cadillac CTS-V to support team drivers – Andy Pilgrim and Johnny O’Connell. 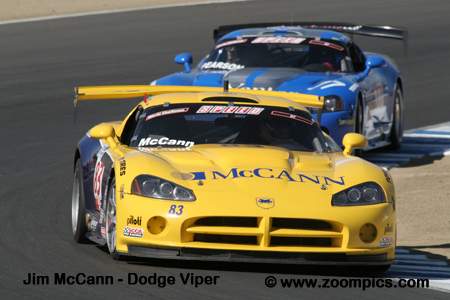 He had an eventful race which included two pit-stops to repair damage after contact with Michael McCann’s Dodge Viper. Despite this setback he moved through the field and finished third – setting the fastest race lap in the process. 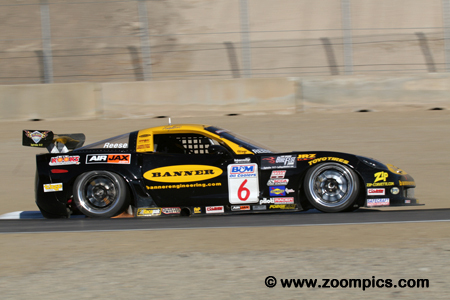 Leighton Reese was the fastest qualifier in the Banner Engineering Chevrolet Corvette C6. Reese led the first sixteen-laps but make a mistake at corner-six allowed Ricardo Imery to take the lead. The incident damaged Reese’s front suspension and he surrendered second to Pobst. He was in fourth when the checkered flag fell. The Dodge SRT Viper of Tommy Archer qualified eighth. During the race he passed sixth place starter Johnny O’Connell and he gained another position as the result of an incident between seventh fastest qualifier Michael McCann and Max Angelelli. He would receive the checkered flag in sixth place. 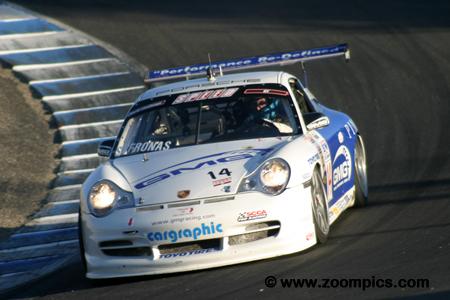 Series veteran, James Sofronas, started fourth at Laguna Seca. Sofronas raced the No. 14 Global Motorsports Group Porsche 911 Cup and finished fifth. He had a season high fourth twice – the first was at opening round in Sebring and another at Mosport. Six top-ten finishes allowed him to score an eighth in the Drivers’ Championship. Lou Gigliotti drove the No. 28 LG ProLong Tube Headers Chevrolet Corvette C6. Gigliotti qualified fourteenth at Laguna Seca and moved up the order to finish seventh. 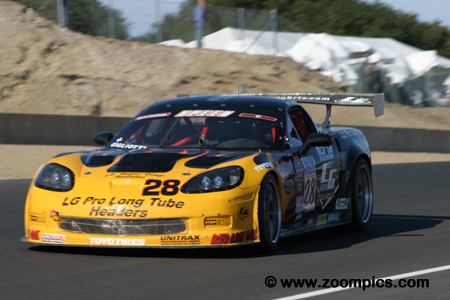 During the 2006 season, he scored victories at Mid-Ohio and Miller Motorsport Park. Gigliotti was second in the 2006 Drivers’ Championship - just six-points behind Lawson Aschenbach. The No. 69 Nissan Skyline GT-R was driven by Igor Sushko. 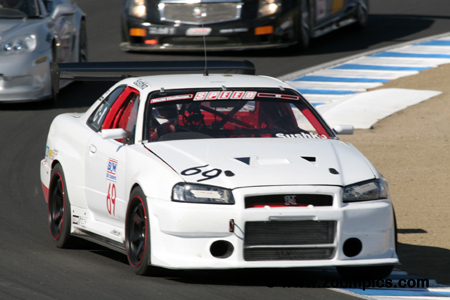 The Skyline is an all-wheel drive car powered by a twin-turbocharged 2.6-liter inline-six cylinder engine. This Nissan model scored many victories in Japan and Australia. Sushko started thirty-fourth at Laguna and finished thirty-first. He did not have much success with the car – his best finish was a seventeenth at Long Beach. 1996 and 1997 British Porsche Cup Champion, Johnny Mowlem joined Autosport Design Racing driving an Aston Martin DB9. 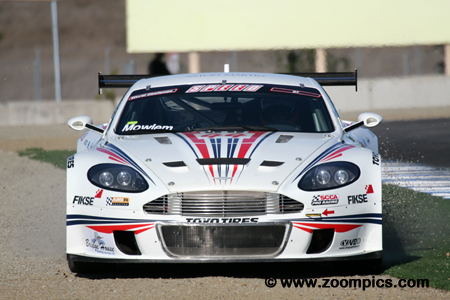 Here he goes off-track at Laguna Seca’s corner-eleven during practice. Mowlem qualified thirteenth in the final round but finished two-laps behind the leader in twenty-fourth. His best result of the 2006 season was a fifth at Road America. 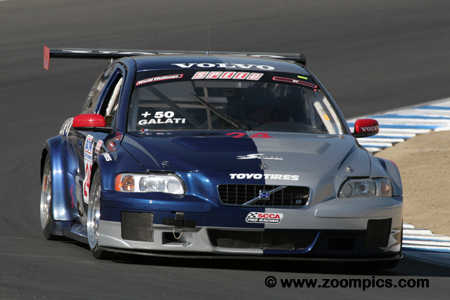 The Volvo S60R made its first appearance with Michael Galati behind the wheel at Mid-Ohio. The Volvo was powered by an inline-five cylinder engine. The 2.5-liter motor was turbocharged and the car also featured all-wheel drive. In wet conditions, at Mosport, Galati put the all-wheel drive to good use by winning and lapped all but second place. At Laguna, he started thirty-second and did not complete a race lap.